"Men of letters will not be called Writers in the time soon to be, but rather, Narrators. Little by little the taste for style and for pompously decorated phrases will die away, but the art of utterance will take on unheard-of importance. Certain Narrators will be sought out for their fine address, their contagious sympathy, their thrilling warmth, and the perfect accuracy, the fine punctuation of their voice. The Author Depositing his Voice at the Patent-Office to Prevent Counterfeiting. "The bibliophiles, who will have become phonographiles, will still surround themselves with rare works; they will send out their cylinders to be bound in morocco cases, adorned with fine gildings and symbolic figures, as in former days. The titles will be imprinted on the circumference of the case, and the most exquisite cases will contain cylinders specially copyrighted, editions of a single copy, in the voice of a master of the drama, of poetry, or of music, giving impromptu and unpublished variants of celebrated works. The Binding of the Future. "Hearers will not regret the time when they were readers; with eyes unwearied, with countenances refreshed, their air of careless freedom will witness to the benefits of the contemplative life. Stretched upon sofas or cradled in rocking-chairs, they will enjoy in silence the marvellous adventures which the flexible tube will conduct to ears dilated with interest. 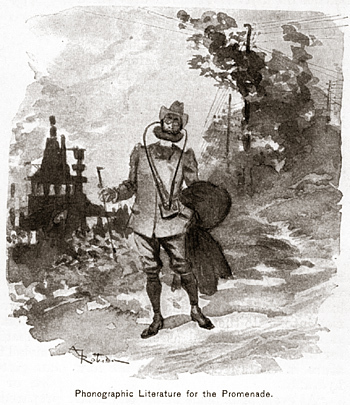 "At home, walking, sightseeing, these fortunate hearers will experience the ineffable delight of reconciling hygiene with instruction; of nourishing their minds while exercising their muscles for there will be pocket phono-operagraphs, for use during excursions among Alpine mountains or in the cafions of the Colorado." "At every open place in the city little buildings will be erected, with hearing tubes corresponding to certain works hung all around for the benefit of the studious passer-by. They will be easily worked by the mere pressure of a button. On the other side, a sort of automatic book-dealer, set in motion by a nickel in the slot, will for this trifling sum give the works of Dickens, Dumas père, or Longfellow, on long rolls all prepared for home consumption. "I go even farther: the author who desires personally to bring his work to the public knowledge after the fashion of the trouvères of the Middle Ages, carrying them about from house to house, may draw a modest but always remunerative profit by renting to all the inmates of the same apartment-house a sort of portable organ, which may be slung over the shoulder, composed of an infinite number of small tubes connected with his auditory shop, by means of which his works may be wafted through the open windows to the ears of such lodgers as may desire amusement in a moment of leisure, or cheer in an hour of solitude. Phonographic Literature for the Promenade. "Is this all? By no means. The phonography of the future will be at the service of our grandchildren on all the occasions of life. Every restaurant-table will be provided with its phonographic collection; the public carriages, the waiting-rooms, the state - rooms of steamers, the halls and chambers of hotels will contain phonographotecks for the use of travellers. The railways will replace the parlor car by a sort of Pullman Circulating Library, which will cause travellers to forget the weariness of the way while leaving their eyes free to admire the landscapes through which they are passing. "Have no fear; it will follow the general law, for public curiosity will go on forever increasing, and men will soon be dissatisfied with printed interviews more or less correctly reported. They will insist upon hearing the interviewee, upon listening to the discourse of the fashionable orator, hearing the actual song, the very voice of the diva whose first appearance was made over-night. What but the phonographic journal can give them all this? The voices of the whole world will be gathered up in the celluloid rolls which the post will bring morning by morning to the subscribing hearers. Valets and ladies'-maids will soon learn how to put them in place, the axle of the cylinder upon the two supports of the motor, and will carry them to master or mistress at the hour of awakening. Lying soft and warm upon their pillow they may hear it all, as if in a dream — foreign telegrams, financial news, humorous articles, the news of the day. The Author Exploiting his Own Works. "Your objection does not embarrass me," I replied; "illustrations will be abundant and realistic enough to satisfy the most exacting. You perhaps forget the great discovery of To-morrow, that which is soon to amaze us all; I mean the Kinetograph of Thomas Edison, of which I was so happy as to see the first trial at Orange Park, New Jersey, during a recent visit to the great electrician. The Romance of the Future. "Be all this as it may, I think that if books have a destiny, that destiny is on the eve of being accomplished; the printed book is about to disappear. After us the last of books, gentlemen!" Editorial Rooms of the Phonographic Journal of the Future..
"Either the books must go, or they must swallow us up. I calculate that, take the whole world over, from eighty to one hundred thousand books appear every year; at an average of a thousand copies, this makes more than a hundred millions of books, the majority of which contain only the wildest extravagances or the most chimerical follies, and propagate only prejudice and error. Our social condition forces us to hear many stupid things every day. A few more or less do not amount to very great suffering in the end; but what happiness not to be obliged to read them, and to be able at last to close our eyes upon the annihilation of printed things!" Impending Maladies of the Ear. This page was last edited on 24 October 2015, at 04:21.